There are over 20 skyscrapers within the vicinity of Raffles Place. Each one is estimated to be at least 30 storeys high. Grand corporate mountains such as the UOB towers go much higher. Each floor of a building can sit about 60 to 70 people, on a rough guess. 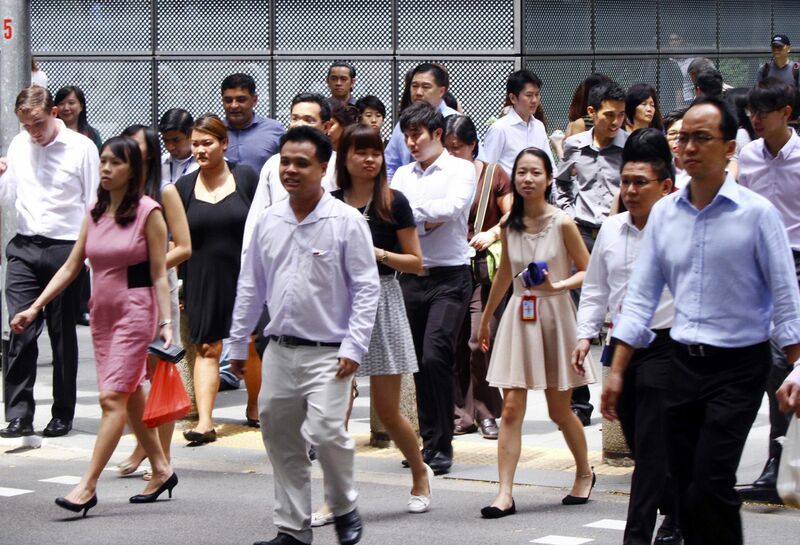 These assumptions gives us a good stab at the number of people working at Raffles Place. This number is some 42,000 strong. At 12pm each day these 42,000 people throng the streets in search of food. The journey in search of food starts off at the lifts. A long, depressing wait for the lifts. Some older buildings are still designed to stop at each floor. The modern ones will have it better but on average, it will still cost you about two frustrating, quiet, wifi-less minutes watching people getting in and out of a lift. 30th floor. Stop. 29th floor. Stop. 28th floor. Stop….27th…26th…25th…and just when you think it would be smooth sailing, 24th floor. Stop. Two long agonising lifetimes pass you by before you get to the ground floor. Then there is the heat. The Singapore mid-day sun delivers a payload of 32 degrees celcius on a cool day. Power this with tropical humidity and no wind, it feels more like 35 or 36 degrees. You get out of the office and depart from life sustaining air conditioning and start a radiated, ultraviolet light drenched trek to your foodcourt. And then after 10 minutes in the heat (or could be 10 hours, who knows with all that sun), you arrive at your stall of choice soaked in sweat and misery. Then you face: the hawker. The hawker is a grumpy middle aged person, disgruntled with life, angry with the government and sees you as an entitled office worker who’s attained everything he doesn’t have in his life. “What you want, come faster…!” he barks as he hurries you with your order. You meekly tell him your request and he hurries the sauce drenched, hastily prepared food into a small styrofoam box, packing with it some chilli and dollops of impatience and unhappiness. You then hand him your money and he receives it with the same gloved hand that he used to handle your food with and with eyes on the next starving office worker, you slink away from his presence. Your shirt is now soaked in sweat and you emerge from the foodcourt smelling like sambal and shame. Back into the scorching sun you go as you trudge back to your miserable little cubicle to consume the small package of sustenance that cost enough to have fed a third world family for a week. Lunch hour, to an office rat, is a treasured hour. It is the only hour of solace, the only hour that belongs to them and them alone. The one hour that work and bosses cannot molest and one hour to refresh themselves through the indulgence of a simple lunch. Each day at lunch hour 42,000 hungry people go out in search of food and comfort. But they return to their cubicles with a small box of misery.